Lately, I’ve been putting spelt flour into my home-made bread. Much as I would love to have the time to make my bread by hand – and to live in a house which is warm enough for it to rise consistently – I have a breadmaker which is quick and very reliable. 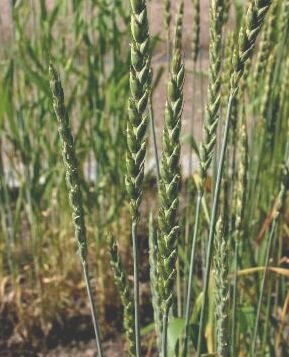 Spelt (Triticum spelta; Triticum dicoccum), also known as dinkel wheat or hulled wheat, is a species of wheat which has been cultivated since approximately 5000 BC. In Greek mythology, spelt was apparently a gift to the Greeks from Demeter, the goddess of the harvest and agriculture. It is a cross of wild grasses and early cultivated cereals which was widely grown in Roman times, and it is becoming more popular again now. It is said to be a good source of dietary fibre, protein, some B vitamins and some minerals. Adding spelt flour (50:50 with normal strong white bread flour) makes very tasty bread. I found this recipe on the side of a packet of Waitrose spelt flour and made it with less sugar. I still had some eating apples from our tree sitting around so I used those rather than cooking apples. They are plenty sweet enough and made a very nice cake. Hi…. I saw your comment about not enough time for bread and wondered if you had tried a no knead sourdough? You mix it up then leave for it to do its thing… In a cold kitchen that might be 24 hours.. Which is quite convenient really. I make 2 loaves at a time (energy saving) and pop one in freezer. No, never tried that – though I love sourdough, I worry that the starter might take over my life with its constant need for food! Maybe I should give it a go again! oh, those blondies do look lovely!